Meanwhile, cook pancetta in olive oil in a large saucepan for 3-4 minutes on medium heat. Add the onion, garlic and bay leaf, and cook until softened. Add the turkey or chicken, stir and cook for 5 minutes or until completely heated..
Add the cream, 2 tablespoons feta cheese, allspice, salt and pepper. Cook over low heat until the sauce has the desired thickness. Drain the pasta and add to the sauce. Mix thoroughly to combine. 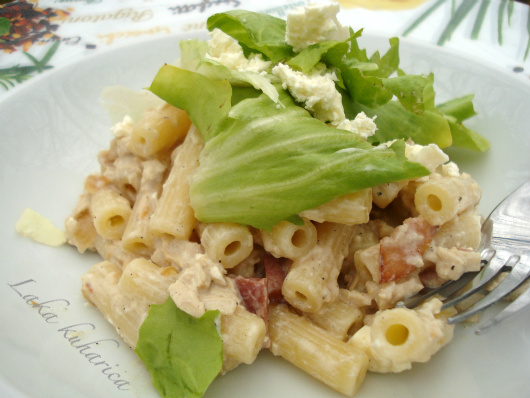 Divide pasta evenly between 4 pasta plates, add some torn lettuce leaves and sprinkle with the remaining feta cheese. A great way to use Sunday leftovers!